Before the summer holidays, Delyth, who works for the Town Library, visited the school with details of a reading scheme which allowed children to borrow books from the library over the summer holidays, and receive prizes for taking part in the Story Lab. 116 pupils from the school took part, with 31 of them completing the whole six weeks. They received a certificate and a medal for their efforts - well done you! During our Whole school assembly today, the School Council officials shared a message with the rest of the school regarding our Humanitarian Campaign this year. The name of the campaign is Hillcrest, which is a charity supporting children in South Africa. One of the school's families - the Pitchers - are currently out in South Africa helping with the campaign. We hope everyone can contribute to the campaign, and we look forward to welcoming Mrs Pitcher to the school next month to receive a donation on Hillcrest's behalf. "Today between 12.30 and 1.30, we learnt how to play golf with Jack Roberts and Gwilym Williams. The technique we learned about today was putting. First, Jack showed us how to hit the ball properly with a putter - it was really hard to get the ball into the middle of the target discs! Then, we were split into four groups, to try and hit the cones from different distances. The first target was about 1 metre, then the target doubled, and because time was running short, we went straight to around 15 metres! We had an amazing time and I'm sure a couple of us will start going to the local golf club to practise more!" Year 6 pupils help load the van with bags that were contributed by parents of the school. Thank you all for your contributions - the clothes, shoes etc are now being sent to the company and the school will receive £500 for every tonne collected. 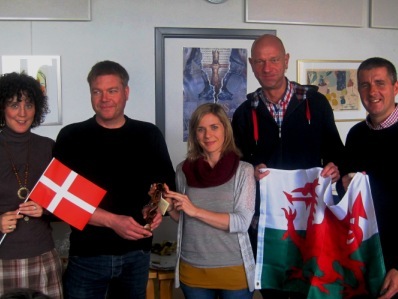 Three members of staff have recently returned from an international visit with Denmark. The purpose of the visit was to start a Comenius project which will last two years. Teachers from the six European countries linked to the project met for the first time in Denmark in order to discuss ideas and share experiences regarding teaching and learning. The countries joining us in this project are Denmark, Italy, Finland, Turkey and Republic of Ireland. The pupils in these schools will work together on this project for the next couple of years, with the first task set already - to design an official logo for the project. We had a lot of fun learning about Thomas Mansel’s mum’s work. She is a Paramedic who works hard helping people. It was fun to wear the clothes and learning how to put bandages on each other! The Ambulance’s siren was very noisy indeed! "On Wednesday the 17th of October, a bus full of Year 5 children went on a trip to Castell Henllys. A Celtic woman called Merin came to meet us from the bus, took us to a time stone and took us back to Celtic times. We had a fun day, building walls, baking bread, and we even had our faces painted with the patterns of the Gods - we all looked quite different! It was a fantastic trip and we learnt a lot about the Celts." Year 6 pupils enjoyed a very interesting visit to the National Wool Museum in Drefach Felindre. By watching the machines at work and with Non guiding us around the mill, we learnt how the wool goes from being on the sheep's back to an item of clothing that we can wear. Everyone also had the chance to experiment with wool, by creating a felt and decorating it with various colours and patterns - thank you to Joanna for working with us in the crafts room. The biggest fun of course was dressing up in various woollen coats and shawls - we looked so cool! Year 3 - 6 pupils had a lot of fun recently when they visited Penweddig School for an Urdd Jamboree with Martyn Geraint! The pupils (and teachers) enjoyed singing and dancing non-stop for around an hour-and-a-half! What fun! Thank you to the Urdd and Anwen Eleri for organising. To raise the older pupils' awareness of the effects of drugs and alcohol, Thea from Prism visitied the school and spent two days in Year 6's company. The pupils had opportunities to discuss the effects of drugs and alcohol on the body, as well as taking part in practical activities. Many thanks to Thea for an interesting and valuable session. The extension has now been completed, along with the expansion of the children's collecting area by the school gates. Thank you to the construction company RL Davies we are very pleased with the new building - an extension to the original hall giving us the option to have one large hall for whole school assemblies or school eisteddfod etc, or to have two smaller halls for P.E and music lessons. The large area outside the main gates is in response to parents' comments in the end of year questionnaire suggesting more area for collecting children at the end of the school day. This year again an International Day was held at the school to celebrate the cultures and traditions of various countries of the World. Every year group studied a different country, with the children wearing their country's traditional costume - India, Argentina, France, Mexico, Spain, Italy, Scotland and of course, Wales. Many thanks to all who made such an effort to make today a success - to the children for wearing such dazzling outfits, to the staff for organising interesting activities, to Penweddig School pupils for their activities in the school hall, to various local businesses for supplying food, and to the pupils' parents and families for their company during the afternoon. "Today we went to the Centre for Alternative Technology which is near Machynlleth. The bus left the school at 9am and by 10am were arrived and were ready for a some fun! Firstly we went on a trains Martha and Ani) which are powered by water, then we went through mole tunnels where we saw creatures which had been enlarged - they were huge! We then had a Guide who showed us around the centre, explaining the various technology at work there, including soalr panels, windmills and a wave machine - it was all very interesting "
This morning Year 6 visited the Town Library in order to borrow books to read during the next month. Every month Year 6 will be visiting the library to make use of its fantastic facilities and borrowing from a wide choice of books available to us. It was great to see every pupil a full member of the library, using their individual cards to borrow and return books. They're already looking forward to next month's visit! Congratulations to pupils from the school who competed and were successful in the Adasc swimming gala which was held in Aberystwyth over the weekend.